At its roots, DMARC is a multi-faith collaboration working to meet basic needs in the Des Moines community. We have relationships with members of Baha’ism, Buddhism, Christianity, Hinduism, Islam, Jainism, Judaism, Sikhism, Unitarian Universalism and Native American religion. The Des Moines Area Religious Council and The Comparison Project are proud to co-host the third annual Interfaith Youth Leadership Camp. 20 high school students representing a diverse array of religious traditions and communities will spend five days and four nights at Drake University, learning about each other’s religious beliefs and practices. Participants will create and share a digital story that expresses a personally meaningful faith experience, practice, or belief, visit religious communities in Greater Des Moines, and discuss with each other the principles and practices of interfaith leadership. Interfaith Youth Leaders will each receive an honorarium for their participation in the camp. A Spectrum of Faith: Religions of the World in America’s Heartland invites readers on a vivid journey through words and pictures into the diverse religious communities of greater Des Moines. Explore the south-side office park transformed into a Buddhist monastery as well as the Basilica in the city’s center named to the National Registry of Historic Places; discover the Hindu temple rising above the cornfields of nearby rural Madrid along with the mosque, synagogue or gurudwara tucked away in a neighborhood near you. Whether they arrived before last century or just last decade, these Iowans who practice the world’s major faith traditions— Sikhism, Buddhism, Christianity, Judaism, Hinduism, and Islam—extend the state’s proud history of welcome to readers of all faith backgrounds. Get to know the fascinating array of individuals, faith traditions and worship practices belonging to the many religious communities who call Iowa home. 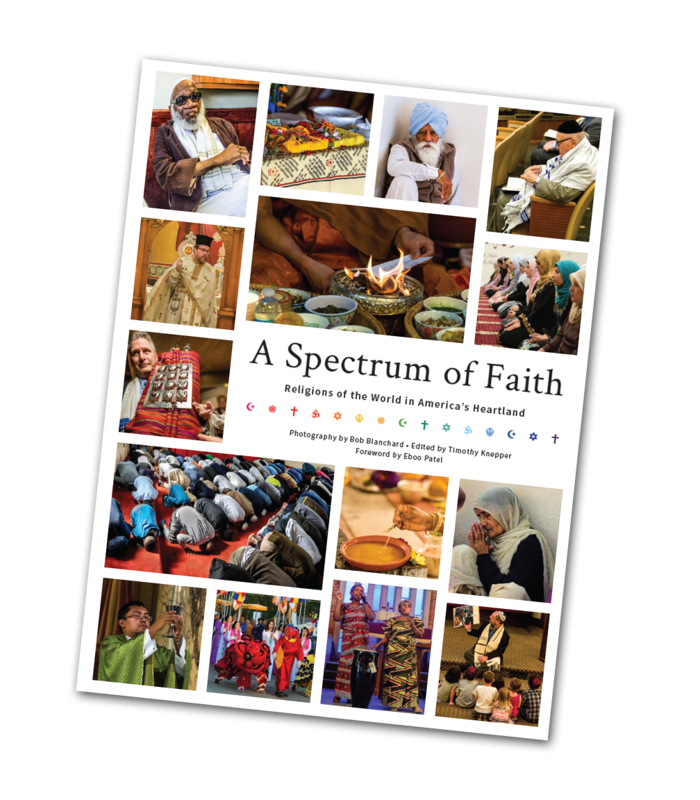 A Spectrum of Faith: Religions of the World in America’s Heartland is a joint product of Drake Community Press, The Comparison Project, photographer Bob Blanchard, and DMARC. Support comes from the Slay Fund for Social Justice and Cultivating Compassion: The Dr. Richard Deming Foundation. All proceeds from the book support the DMARC Food Pantry Network. Every Monday morning a diverse group of DMARC supporters and friends gathers for a book study and to share thoughts and reactions. Books generally have a religious focus and most often center on the interfaith aspects of the diverse traditions found in our community. Participation in the group is open to all. For information, call the DMARC Offices at 515-277-6969. During this time of merging cultures and ethnic diversity, we aim to foster inter-religious dialogue to educate each other on various faith traditions. Please provide a gift today that will help us with our mission to inform and educate about Iowan faith diversity. Donations received by DMARC for Interfaith Engagement program will continue to be used for special events and education opportunities. Thank you for your support!